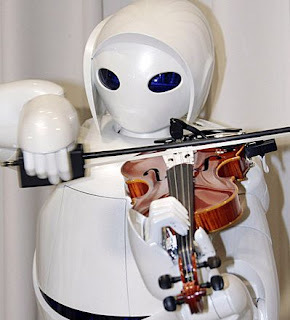 Toyota have unveiled a new robot that can play the violin. 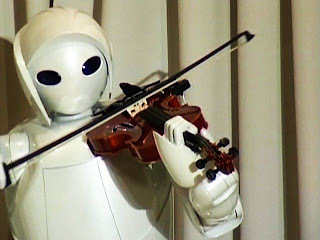 Toyota's robot violinist has 17 computer-controlled joints in its arms and fingers, which allow it to hold the violin, gently draw the bow, and correctly press the strings against the fingerboard. In a recital held at a Toyota showroom in Tokyo on December 6, the 152-centimeter (5-ft) tall humanoid entertained guests with a rendition of "Pomp and Circumstance." The rendition was note perfect, but was described by some as "stilted". "Over the next two to three years, we will put the robots to the test through trial applications and see what kind of business possibilities they present," Toyota president Katsuaki Watanabe told The Guardian. Robotics will become a core business for Toyota by 2020. The company will unveil medical robots next year, and plans more advanced "partner robots" for domestic duties, nursing, healthcare and short-distance personal transport by 2010. Toyota is a comparative newcomer in the robotics field compared to manufacturers such as Honda. Demand for robots is strong in Japan, particularly in the domestic and medical fields.